Black cat from the left, white cat from the right - every cat brings good luck here and looks classy on top of it. powder-coated steel, set of 2, not magnetic! 1 pc. 17,60 EUR ea. 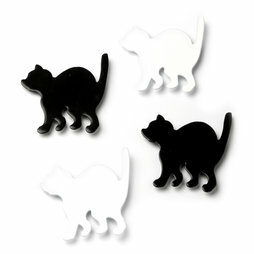 Hot kitties or cool cat - the cat magnets enrich any magnetic board.